How do you like this one? It reminds me very much of a winter scene in the forest. I love this! Where can I get the polish? Which polish were you referring to? Emilu de Molly is an Australian based indie. She does have an Etsy shop over at http://www.etsy.com/shop/emilydemolly I do believe this color has been discontinued. Oh my gosh, I’m so in love with this!! The colors, the design, just it’s way too cute and I need this on my nails asap!! This may be my favorite holiday design for nails that I’ve seen this season! Oh! And thank you for taking part in the giveaway! This deer is adorable! 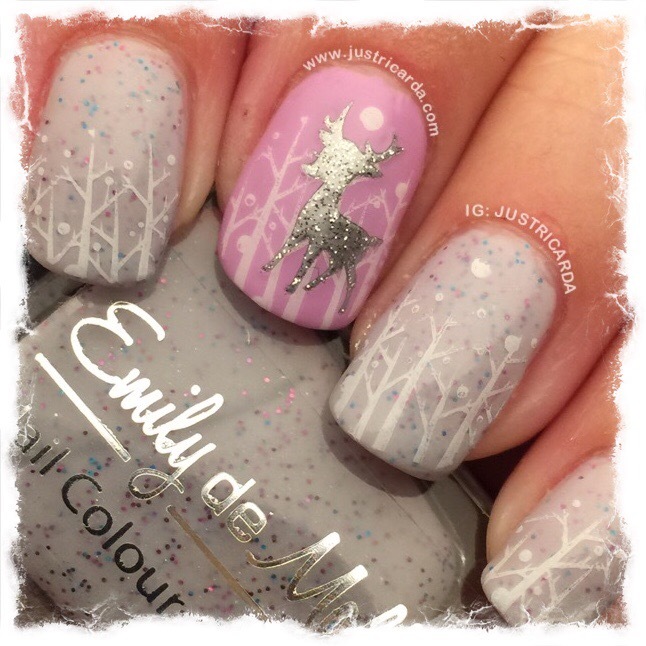 And I love the wintery scene on the other nails. Thanks for your blog and for the giveaway!